PLEASE NOTE: Per Manufactuerers' specifications, this product cannot be shipped outside of the USA. If you wear Invisalign or a retainer, you know how difficult it can be to keep it clean and avoid an icky smelly dental appliance. Cleanse Freshen Go. cleansing towelettes are the answer. In just seconds, your retainer will be clean, germ-free, and minty fresh. Watch the video. Each box contains 20 individually wrapped Cleanse Freshen Go. towelettes. To use, simply wipe your dental appliance with the specially textured towelette. That's it; no rinsing required! In no time, you can pop your clean appliance back into your mouth, or safely store in your retainer case. The towelettes are infused with a pure mint flavor and scent that leaves your retainer tasting and smelling fresh. They do not contain Persulfate (a chemical which sometimes causes an allergic reaction). Throw these towelettes into your purse, backpack, or briefcase for freshness anytime you need it. Great for camps, sports, after school activities, or airplane travel -- anywhere you need to freshen your dental appliance on the run! Now your kids won't have an excuse for dirty smelly icky retainers. Keep these wipes in their lunchbox to help prevent buildup of white plaque and germs that can ruin an expensive retainer. Throw a few into your son or daughter's sports bag to help keep their sports mouthguard fresh and odor-free. Great for any situation where you need to discreetly and quickly clean a removable dental appliance. If you find that you're using this product often, you might want to consider buying a bulk bag of 100 individually wrapped towelettes for convenience and savings. Please note: Remove your dental appliance before cleaning. Do not put this product into your mouth or use on natural teeth. Cleanse Freshen Go is not sold in local stores. PLEASE NOTE: Per Manufactuerers' specifications, this product cannot be shipped outside of the USA. You get 20 individually foil-wrapped towelettes per box. A bulk bag of 100 towelettes is available. Does not contain Persulfate. Sorry, we do not have a list of other ingredients in this product. Please contact us if you have an allergy concern. Remove your dental appliance before cleaning. Do not put this product into your mouth or use on natural teeth. This is a very convenient product for cleaning retainers or other dental appliances, especially if you're "on the go." People with Invisalign aligners really love these wipes. If you're in the stage where you need to wear a retainer 24/7, you're always taking it in and out of your mouth. These wipes ensure that you're putting a fresh clean retainer back into your mouth every time. They're invaluable for travel, or for kids at school or camp. Any time you don't have access to running water to rinse your retainer, you can use these wipes instead. They kill germs, too! What are the ingredients in Cleanse Freshen Go? The product does not contain Persulfate. We do not have a list of other ingredients in this product. If you have an allergy concern about a specific ingredient we can contact the manufacturer and ask about it. It does not contain Persulfate. We do not have a list of other ingredients in this product. If you have an allergy concern, we can contact the manufacturer and ask about the ingredient or ingredients that concern you. 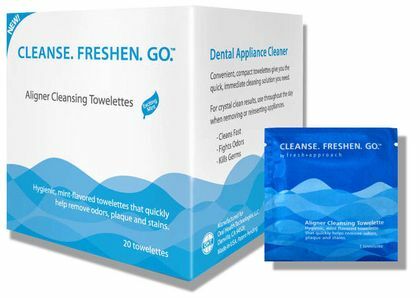 The Cleanse Freshen Go Invisalign Retainer Wipes are great to use when it's not convenient to brush & clean your retainers. Just wipe the retainers. Rinsing isn't necessary. ProsSmall individual packets fit easily in a purse or pocket. I bought a pack of these wipes for my recent trip abroad. I honestly didn't want to travel with retainer soak bath container and powder cleaner.I wanted these because I was already carrying too many liquids with me as well. Got these just so I can meet the free shipping quota. I was pleasantly surprised with how nicely they worked while in a rush on the go. It leaves no "dirty retainer" smell and after cleaning my appliance, it didn't taste weird when I put it back in my mouth. I would recommend these to keep in your purse when you're on the go, but not as a primary method of cleaning. I use these when I don't have access to water or when I need to clean my Invisaligns on the go.